a multi-touch screen interface for live cinema editing, intended for the manipulation of narrative films. 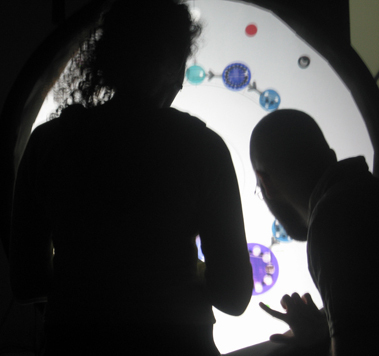 SPROCKET is a physical interface for live-cinema performances. It was originally developed for narrative feature films edition in real time, in movie theatres. The idea is to control what is been shown in the big screen through the interface. It was originally developed for the feature-film RESSACA, a Bruno Vianna’s project. He would be present in every performance and edit his narrative film live. 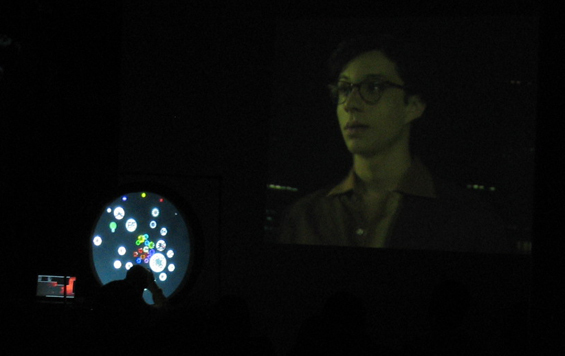 The interface allows elements of the movie to be manipulated with the fingers. As this screen has a one meter of diameter and is positioned next to the theater’s main screen, the public can follow the whole editing process. The interface created allows the visualization of the whole material and its organization, through the creation of links which define the scene order. Besides, it is possible to manipulate every shot of every sequence, changing its position within the movie.